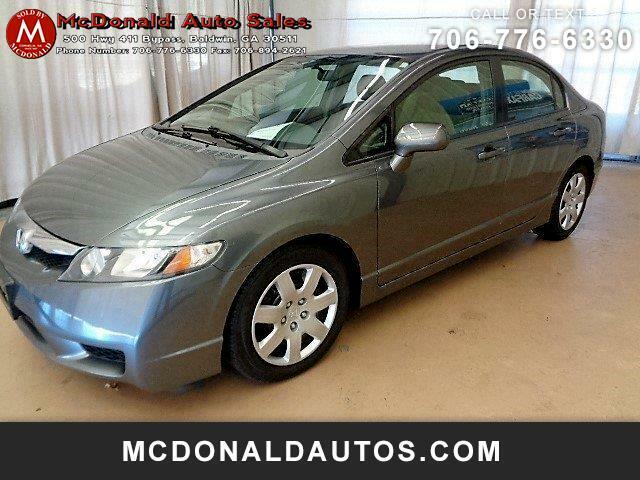 2009 HONDA CIVIC LX, 2 OWNER CLEAN CARFAX CAX, 4 DOOR SEDAN, GREY EXTERIOR WITH GREY CLOTH INTERIOR, RUNS AND DRIVES LIKE A HONDA SHOULD, ALWYAS!!!! GREAT CAR INSIDE AND OUT 100% READY TO GO ANYWHEREALL OF THE VEHICLES ON WWW.MCDONALDAUTOS.COM ARE LISTED WITH CASH PRICES PLUS A $200 ADMINISTRATION FEE. ALL VEHICLES ARE SUBJECT TO PRIOR SALE. PLEASE CALL AT (706) 776 - 6330 OR E-MAIL US AT mcdonaldauto@windstream.net FOR AVAILABILITY.